At the Augmented World Expo Europe press conference in Munich today, RE'FLEKT will unveil the addition of remote video calling to their RE'FLEKT One enterprise augmented reality platform, in addition to ARKit and ARCore apps that demonstrate the platform's capabilities. Like similar features on other platforms, RE'FLEKT Remote allows users to call remote support experts, who can annotate the camera view on the user's smartphone, tablet, or smart glasses to help diagnosis troubles. However, RE'FLEKT Remote also includes a skills-based routing feature so users can reach the first available expert rather than contacting an individual who may not be immediately accessible. In addition, RE'FLEKT Remote enables individual and group chat with file sharing. Compatible with iOS, Android, and Windows, the RE'FLEKT One platform enables companies to migrate their existing knowledge base content to augmented reality applications. Companies can import existing materials and 3D models into the platform to build step-by-step animations and interactive touch points. The content is activated by scanning markers or identifying objects through the companion app. The company also introduced Augmented Repair. 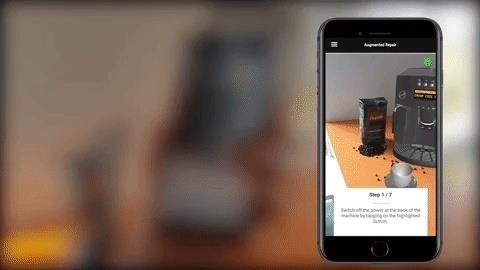 Built on ARKit and ARCore, the mobile app shows how companies can apply the platform for in their own support functions. 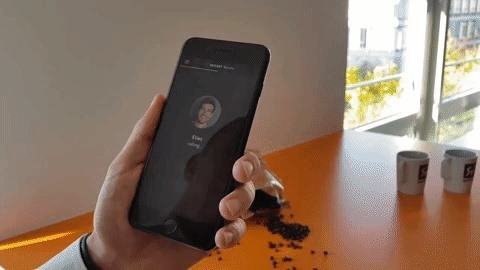 With a virtual coffee machine, the app simulates a remote support scenario, with an imaginary customer service representative drawing instructions on the user's camera view. The app, available for compatible devices through the App Store and Google Play, also provides a repair manual example, with the app scanning the coffee machine and animating step-by-step instructions to fix the issue. Vuzix, and the like are building the hardware to run it on. The prospect of augmented reality for enterprise has the attention of strategic investors like Boeing, General Electric, and Ericsson, as well as venture firms and incubators, like Presence Capital and Techstars. "I think that is AR at its best, which is truly augmenting intelligence and knowledge in general so humans can focus on exercising higher levels of thinking around creativity, strategy, communicating, persuading, and influencing and less time on gathering information and having contextual awareness about a subject," said Lara Jeremko, strategic advisor at Techstars. "I think AR is a super interesting opportunity and really a killer app for maintaining an adaptable and responsive workforce."